With beauty industry buzzwords like “organic,” “all-natural” and “paraben-free” appearing all over today’s health and beauty marketplace, how do you know who to trust? It doesn’t take long before you find yourself standing in the cosmetic aisle with five different products in hand, all claiming to be the best all-natural product out there. Thankfully for us Atlanta ladies, Poncey-Highland’s Fig & Flower is a trusted go-to source for eco-beauty products that truly are natural and good for the skin. 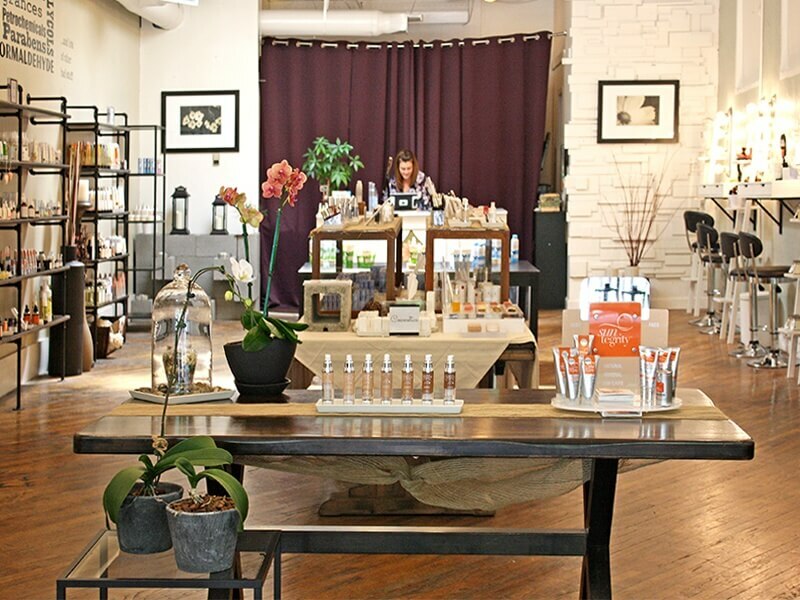 Founded by Sara Lamond in 2014, Fig & Flower is Atlanta’s first all-natural beauty store. Now a blossoming boutique with a growing online presence, Fig & Flower stocks some of the natural beauty industry’s most sought-after products by well-trusted brands. Welcome to Fig & Flower! Ironically, Sara doesn’t have the health and beauty background that one might expect, which is part of what makes her so appealing as the face behind Fig & Flower. With a professional background in law, Sara took interest in health and wellness after joining a Crossfit gym. But after pursuing her law career, she determined that law wasn’t as fulfilling as she had hoped it would be. “Either I was bored to tears or beyond stressed,” she says. “The legal world is so contentious. It’s all about winners and losers. When I started law school, I thought I’d find that sort of challenge invigorating. But then I underwent some personal transitions, including meeting my husband, which led me to re-evaluate the kind of life I wanted to lead.” After making the decision to leave the world of law, friend and then-business partner Blair Wagoner expressed an idea to open an all-natural beauty store in Atlanta. As business partners, Blair then helped Sara learn the ins and outs of beauty labels and ingredients, as well as what to avoid. Sara jokes, “Between Blair and my law school training to research, research and then research some more, I’ve learned more than anyone could ever want to know about natural products. I feel like I’m in a unique position to help others understand natural living though because I don’t come from that background. I’m just an average person who took an interest in it and did the research. So now I get to help people without coming off too technical or judgy.” Even though Blair has since moved on to pursue a career in diabetes prevention on the West Coast, Sara assures that Blair still comes to visit the shop when she’s in town. Pick a color. There are plenty to choose from! Browse the services offered at Fig & Flower. What you see is what you get at Fig & Flower … nontoxic, cruelty-free products in a no-pressure, all-welcoming environment. Sara describes Fig & Flower as “your cool big sister,” which could not be more accurate. “She might know a little more than you about some things, but takes so much pride in sharing the knowledge and watching you grow!” That’s exactly the feeling that I get each and every time I explore Fig & Flower. And since I don’t have a big sister of my own to tell me all about the best in natural beauty, I’m content letting Fig & Flower fill that role. Fig and Flower is located at 636 N. Highland Ave. in Atlanta. Hours are Monday through Saturday, 11 a.m. to 7 p.m. and Sunday from 11 a.m. to 5 p.m. Learn more at shopfigandflower.com.